There is a world between worlds — a place you glimpse from the corner of your eye. A world you sense — but not see. And one of the creatures of this mystical world is the mermaid. 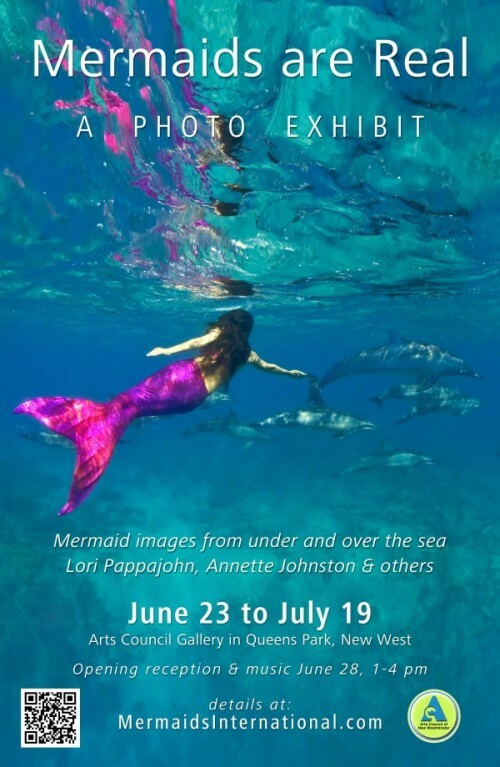 Mermaids Are Real: A Photo Exhibit takes you on a journey to that unknown place — a hidden cove, an underwater reef, or a rocky outcropping where maybe, just maybe, you might catch a glimpse of that illusive and most magical creature. In 2012 I Googled the word ‘mermaid’ and was amazed at what I found — people swimming like mermaids. I realized I could, too. 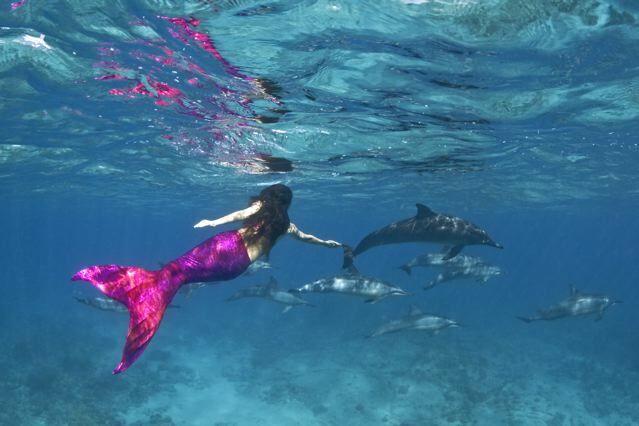 I designed mermaid tails for myself and Annette Johnston and we went to Maui to ‘mermaid’. We began photographing and videoing our adventures, as the depiction of a mermaid under the sea and on the shore is pure poetry. The rich colors of our tails (green, red, pink) are beautifully framed by the deep blues and delicate turquoises of the Hawaiian sea. Add a dolphin or turtle and you have pure magic. We eventually teamed up with some of Hawaii’s top photographers and now have a collection of stunningly-beautiful photos. Come see for yourself — mermaids are real. The exhibit includes videos and the children’s book The Pink Mermaid and Other Tails. A harpist, singer and writer, Lori Pappajohn recently added mermaiding to her artistic life. Fascinated by these mythical creatures, Lori and Annette Johnston (a flamenco, belly and tango dancer) have been on both ends of the camera — photographing mermaids and being photographed as mermaids. They use the human body as an art form to express the mystery and beauty of mermaids both underwater and on shore — as captured by the camera. And their artistic endeavor includes designing and making their own mermaid tails — a challenge in itself. Over the past 4 years, the founders of Mermaids International have worked with some of Hawaii’s top photographers including Bo Pardau, Doug Perrin, Benja Iglesis and Steven Broschat — capturing images underwater and on the shores of Maui and the Big Island. A professional musician, Lori Pappajohn has recorded 11 albums, toured internationally and is director of the highly-acclaimed Winter Harp Ensemble. A registered massage therapist, Annette Johnston was the maussues for REM on several of the band’s North American and European tours.